If you haven't noticed already, I love a good home bake, which is why my Christmas period is largely spent with flour everywhere, the mixing bowl turned on and my head in the oven asking 'are they done yet?'. To try and dispel the myth that home baking is time consuming or requires lots of ingredients that you never have in the cupboard, I've been sharing some of my super easy recipes, to try and get everyone baking this Christmas. Last week I shared my easy peasy recipe for mince pies. That batch lasted a measly 3 days in my house, before there were requests for more. Next time I'm doubling up, and filling even more tupperware with pies! This week I bring you a super simple cake, that can be made with just one flick of a switch. Yup, the whole of this cake is thrown into the mixer at once, meaning you won't have to spend ages cleaning dishes( because no one can deny that that's the worst part of cooking) and wondering what goes in when. 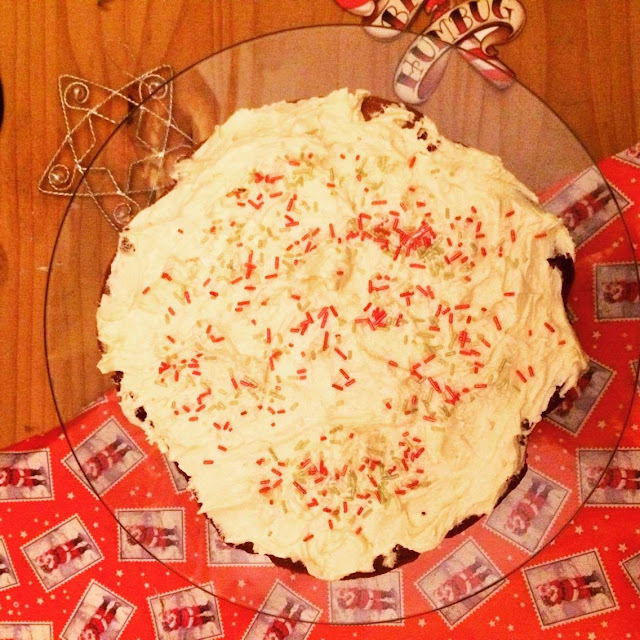 This cake is chocolate orange flavour... why is this a Christmas cake you ask? Yes its true, this can be made at any time of the year, but don't Terry's Chocolate Oranges just signify Christmas to you? I usually have one in my sweetie stocking from Santa, and there's something very festive about the taste of a chocolate orange. So I took my inspiration from Terry, to make this very light and moist chocolate orange cake. And even though I decorated mine with green and red sprinkles, there's nothing to stop you from making a pretty design with some segments of chocolate oranges, or grating it over the icing. 1. Sift the flour, cocoa and baking powder into a mix (or mixing bowl) and add the butter, caster sugar, eggs and orange flavouring (add to your own taste - I added three and had a subtle hint of orange). 2. Mix it all together to until its smooth, then stir in the milk. 3. Half the mixture into two greased sandwich tins (c. 20cm) and ensure it's even and smooth on top. 5. Once cooled, spread the butter cream icing to sandwich the two halves together. Spread the remainder of the icing over the top of the cake and decorate to your liking. 1. Beat the butter, until its a soft paste. And from this all, you'll make an extremely tasty Christmassy cake (for those who aren't lovers of the traditional Christmas cake). Enter my Giveaway for the chance to win a December Survival Kit - 2 days left to enter!